The Aero AT-3 is a sigle engine, largely all metal construction two-seater, low wing basic trainer and light utility aeroplane with fixed tricycle landing gear built by Aero, Mielec, Poland, in ready-to-fly certificated form and as a kitplane. AERO AT Sp.z.o.o. was founded in Poland in 1994 with the idea of marketing an inexpensive two-seat aircraft for basic training and touring. The AT-3 was developed by the Polish designer Tomasz Antoniewski, who had constructed first the AT-1, a single-seat low-wing plane. In 1996, Antoniewski created the AT-2, using experience accumulated during the earlier project. Both projects led to the present-day AT-3, a design derived from the Pottier P.220S Koala. Aero built one AT-3 for flight testing and another for static testing. The prototype AT-3 flew first in 1997. The AT-3 has been specifically designed for the role of flight training. Components of the metal construction of the Aero AT-3 are anodized for corrosion protection. The Aero AT-3 has a robust sprung steel landing gear. The nose wheel is free castoring and the aircraft is equipped with effective, independent toe brakes facilitating excellent ground manoeuvrability with a small turning circle. The large canopy opens forward for easy access to the cockpit. The aircraft is fitted with an electronic stall warner providing both a visual and acoustic warning. The AT-3 is powered by the 100 hps Bombardier-Rotax 912S2 or S4 engine. The Aero AT-3 R100 was certified in the EASA CS-VLA category on 21 January 2005. Customer deliveries of the AT-3 commenced in 2002. There is also a LSA version with larger wing, the AT-4. This aircraft is manufactured for the US market with compliance to the LSA specification with MTOW increased to 600kg and was certified in the US in 2007. The first 28 aircraft were sold under the brand name of its distributor Gobosh (Go Big or Stay Home) as the Gobosh 700. In 2011 a new distribution deal has been struck to market the airplane under its factory name Aero AT-4. In May 2013, Aero AT Sp. z o.o. was acquired by Jiangsu LanTian Aerospace Industrial Park of China with the intention to built the AT-3 in China for the Chinees market. In April 2015, however the new formed Aero AT (Jiangsu) Aviation Industrial bought the entire collection of intellectual property for the M-20 Mewa, a by PZL-Mielec licence-built version of the Piper PA-34 Seneca II. On 30 October 2015, the aircraft manufacturer entered into an investment agreement to build a facility for producing the six-seat M-20 Mewa in Changzhou Konggang Industrial Park. Production of the AT-3 and AT-4 for the European and US markets is to remain in Mielec, Poland. 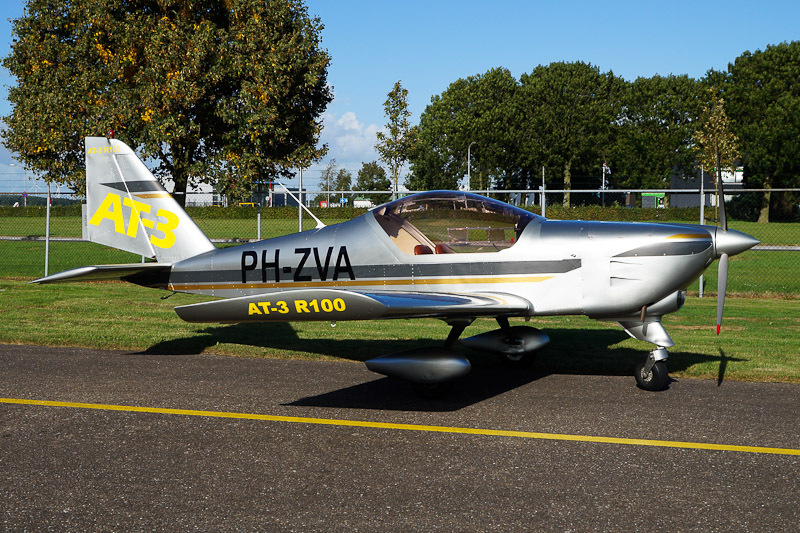 On 15 Augustus 2015, Aero AT-3 R100 c/n AT3-010 was registered PH-ZVA in the Netherlands with Vliegschool Zelf Vliegen, Lelystad. The 2004-built Aero AT-3 R100 was registered before SP-KOS and HB-SFN. Aero AT-3 Serial number AT3-010 was one of six AT-3 aircraft built that were modernized in 2005 in order to comply with the specifications of the EASA CS-VLA Type Certificate. On 30 September 2016, Aero AT-3 R100 PH-ZVA was seen at Lelystad Airport.